Quick tutorial on painting frames. I have been finding that as soon as I find an ornate mirror, regardless of whether its the color I'm looking for or not, I buy anyway and paint if necessary. The mirrors are simply becoming too contemporary now and clients want ornate/vintage looks. Wanted to share my process in case any of my D.I.Y. brides/grooms need to acquire this skill as they get closer to the big day. Photo of the mirror subject for painting. Again, any hint of an ornate pattern on these mirrors no matter the color and I'm likely painting. The mirror that I'm finding are so contemporary now, I have no choice. I like that this one was white too. Blank canvas so to speak. Use painters tape around the edges. This is critical. 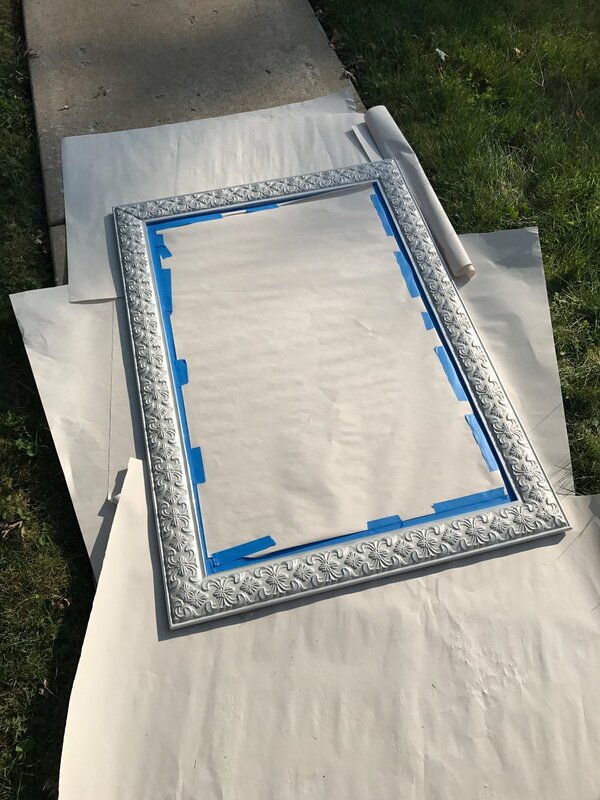 You want to make sure you don't have to use paint remover after you finish painting the frame. Go slow and make sure it is perfectly flush. If you leave a sliver open you'll see a line of paint afterwards. This brand of paint is a "paint and primer in one" so I went right into painting. I definitely recommend a primer though, at least one coat prior to painting. It makes a difference in terms of consistency of coverage. Make sure the frame is dust free as well. Tape off the mirror using newsprint if possible. I used to use newspaper, but I've found that a pad of 24" x 36" newsprint is PERFECT for an average sized mirror. You can seriously tear a sheet off of the pad and be fine. save a few folds here or there. Make SURE you tape it off securely on the edges because the paint will find ANY breaches. Then go ahead and spray the frame evenly. I'd do 2 coats unless you have time for a third. Make SURE to get the inner frame right by the tape because this area will be noticed if you don't have decent coverage there. LET THE FRAME SIT FOR 4-5 HOURS IF UNABLE TO LET SIT OVERNIGHT. Even after 4-5 hours you risk a SLIGHT indentation of your fingerprints on the sides. So much work, I wouldn't risk it. Finished product!!! Client didn't want gold, but a champagne. I thought it came out really nice. Shipped out of state and arrived without incident! Congrats guys! I'm back. Finally replaced the laptop that I killed last season with a fatal spill of coffee so I'll definitely be able to blog more. I've missed blogging for sure! I've started a YouTube channel and have been uploading vids as I work. I've got a few to upload from my Instagram that were informative as well. At least I can upload longer versions to YouTube. 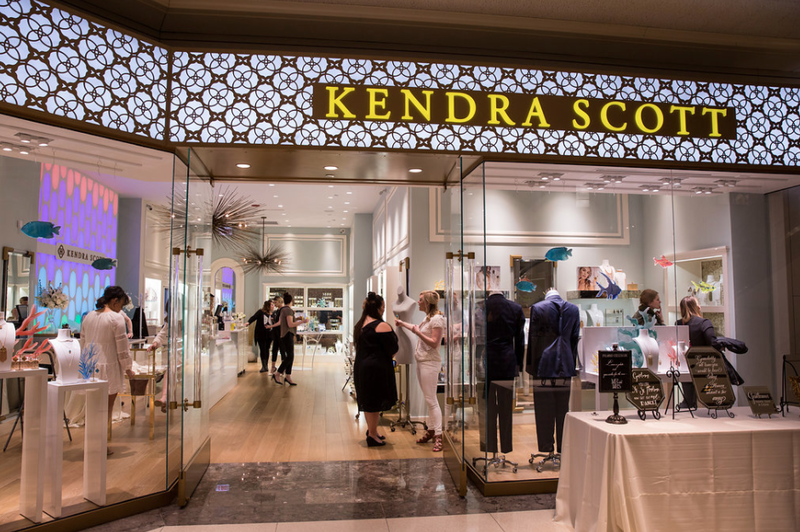 The Kendra Scott event held on 4/30 was a great experience. I met a number of brides and The Simply Elegant Group were wonderful hosts. Wanted to share a few pics, I can't believe its already June 1st, this wedding season is flying by. Have great days everyone. 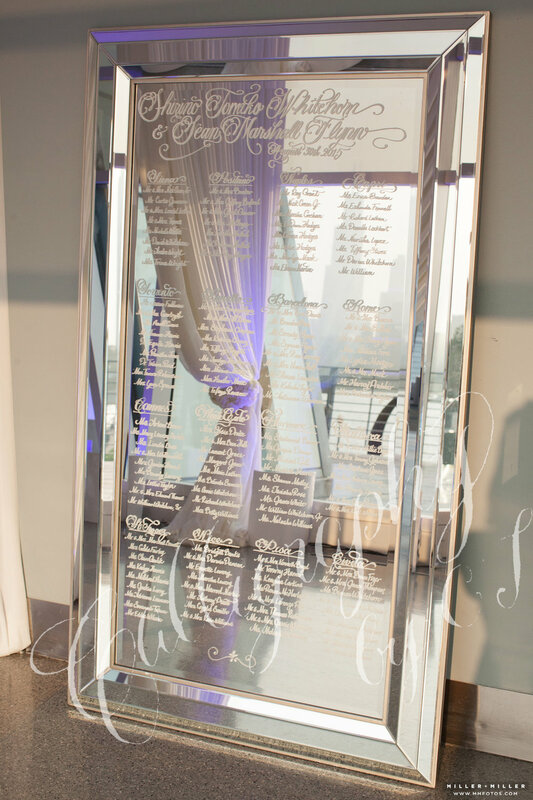 Mirror seating charts are STILL extremely popular. I did my first one back in 2013 and 4 years later, they are likely my most popular item and MOST inquired about "day of" decor element. Alpha Order - Guests organized by last name. I like to add a letter or letters above each "section/group" of names in order to make scanning/finding your name easier. By Table - Guests seated by table name or number - This is a lovely look and one that clients ask for most often, however I like to remind them that anything over 14-15 tables may make it harder for guests to navigate. 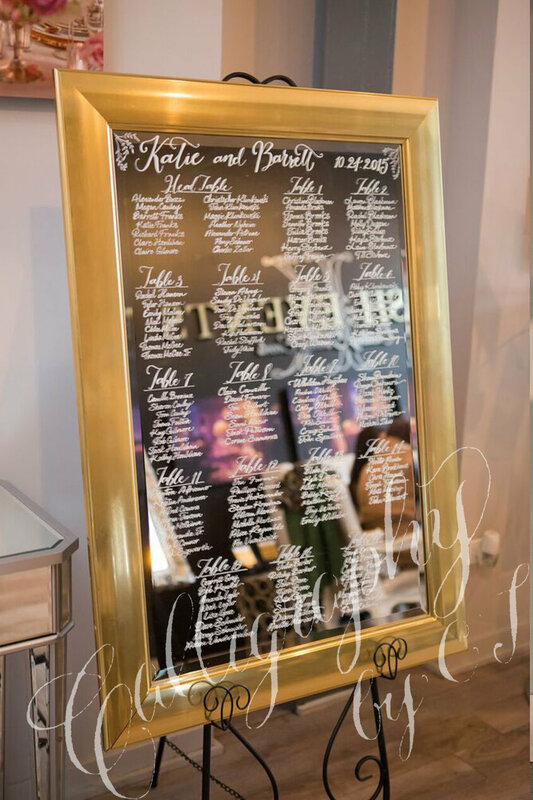 When dealing with leaner mirrors, if you can help it, try to make sure that the guests are not having to look down to the floor for their names. Sometimes you can't avoid it, but if so, add a design element at the bottom in lieu of names. It looks nicer and the guests have a better experience. I've got another free download! Check out these exercises. These strokes will be helpful in gaining control. You should be able to press (firm pressure) and release (ease up on your pressure) with greater control as you continue through this journey. I have put together a video walking you through practicing with this sheet, check it out and download and practice yourself! 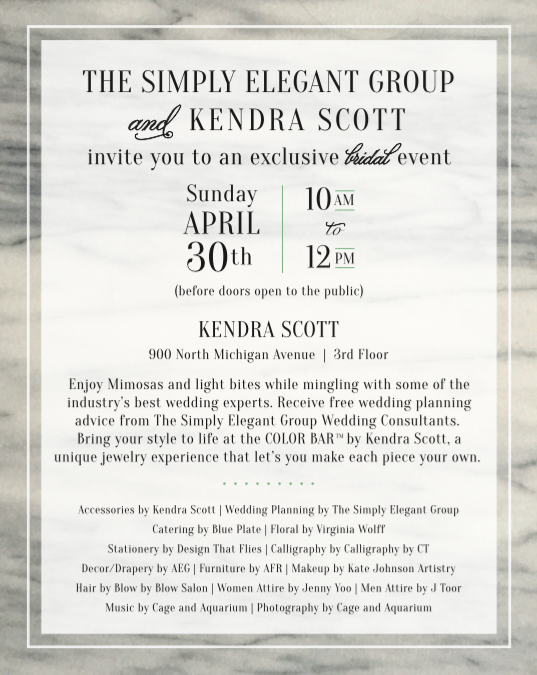 Thanks to The Simply Elegant Group for inviting me to be a part of a bridal showcase Sunday, April 30th! From 10A - 12P on 900 North Michigan (Bloomingdale's Building). Can't wait to see everyone! Wedding season is officially upon us! I am so excited to introduce you to a fresh new font by Deb Sementelli. 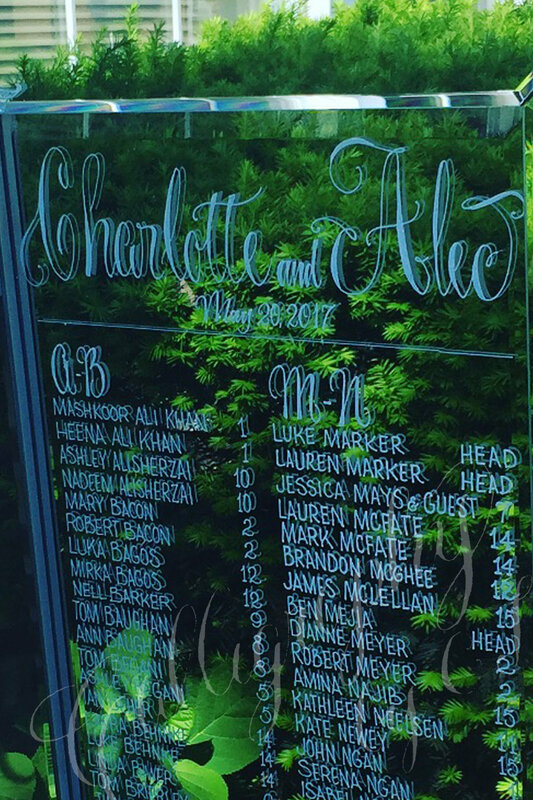 Deb is responsible for some of the most popularly used wedding fonts in rotation now. Bellucia, Dom Loves Mary and Cantoni Pro to name a few. This new font has been fashioned solely by Deb and is a labor of love that reflects a tribute to her sisters. With plenty of alternates, ornaments and flourishes, this font speaks to the kind of creative, signage, and wedding/shower invitations we are seeing all over the internet today. Its fun, whimsical and can be dressed up or down. I believe it is a MUST have for graphic designers, stationers and lettering artists everywhere! GRAB THIS FONT NOW AND SAVE 50% OFF! So glad to be able to offer this fabulous product! Please take advantage now as this offer is limited! Yes, its on a Sunday! I thought parking would be better and learning calligraphy is a GREAT way to spend a Sunday afternoon! New location! Newer content! I'm super excited and hope you can join me! 11:00A-2:30P. Book your spot today! I am SO psyched about the Bridal Brunch coming up at the end of the month! This is my first time visiting Room 1520 and it looks like its going to be a wonderful time had by all. 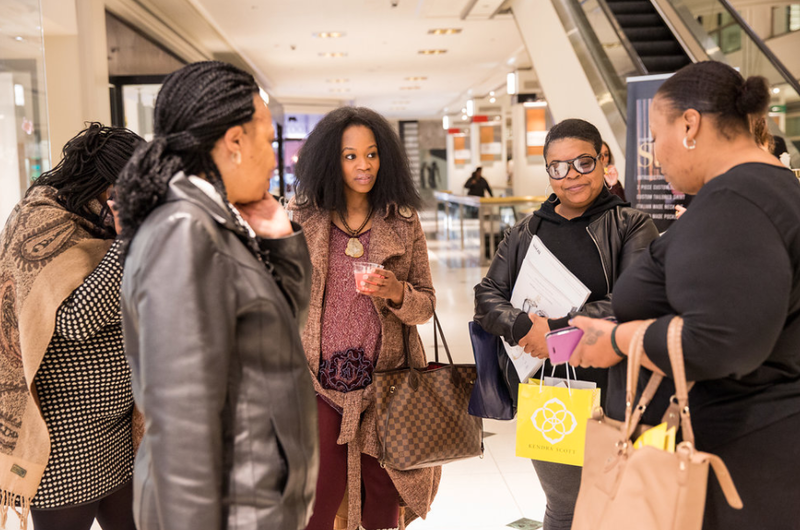 Brides are coming to see vendors from all over Chicago. Hosted by Urban Allure Events & Michelle Cox Photography. 2 Weeks Left to Beginner's Modern Caligraphy! The class is Saturday, March 11, 2017! Start your calligraphy journey THIS year! I hope you can join me for my 1st Quarter class! There will be refreshments, a detailed curriculum, practice sheets and MORE. Better yet, a HALF HOUR has been added to this course so its 3.5 hours! Hurry and book your slot while the Early Bird rate is still available. I've got a goodie for all of you guys who may have put your pen holders down for too long. Its a chance to warm up your wrist with some interesting STROKE PRACTICE! These particular drills are designed to go BEYOND the basics and really get yourself comfortable moving the nib over your paper. Make a few copies, find a quiet spot and sneak in some work on your craft! Indie Wed was a huge success for me. I loved everything. The vibe, the vendors, the couples, it was truly special. Very intimate and "kitschy", I thought it was a one of a kind show. My mirror decor fit in perfectly. Special thanks to Kelly Horvath, the show's founder for accepting my company with open arms. Also need to thank my biz buddy Desiree Dent of Dejanae Events who encouraged me to do this show and also came out to help me field client inquiries. I also heard that there was a special 7:15A segment that featured ONLY my mirrors but I have been unable unfortunately to obtain the footage! I DID make it to the "wrap-up" reel, but it was truly a "blink and you'll miss it" moment, so I made sure to get a screen shot of it. Indie Wed is THIS Saturday! I have been SO busy preparing for the show on Saturday and I'm excited for you guys to be able to come out and see some wonderful independent artists! I am at BOOTH 88! Am I the only one that is finally getting around to adding ornaments to the tree? I've had it up for a couple of weeks, but somehow the ornaments are just making it on! Wanted to quickly share a tutorial re: glitter ornaments. I stumbled onto this recipe (it was in more than one place, I guess its pretty popular) while creating my Cubs ornaments. I ran out of red glitter ornaments and needed to create some on my own. The glitter was large, not fine and seemed to be embedded behind the glass. How exactly did it get stuck there I asked myself? Was the ornament filled with the glitter or was it glued somehow? Well, it turns out there was a method to achieve this look after all! Grab some craft ornaments from Hobby Lobby or just some glass ornaments. 3" ornaments are probably the most popular. Find some Pledge Floor Finish... Yes, Pledge Floor Finish. I found this at WalMart. This is going to be used as your "adhesive". Go ahead and poor a generous amount inside of your ornament. Go ahead and swirl it around. Cover the open cover with a rag and turn it upside down. Careful not to shake it though. Shaking will cause bubbles to form and you don't want that. Empty the excess pledge formula back in the bottle and then add your glitter. You can make a paper funnel to make sure you are not being wasteful. The jumbo glitter flakes look nicer to me than the finer pattern. Voila! Make sure you coat the inside of the ornament with the glitter and it should stick effortlessly to the sides! Recap the ornament, add a bow and you should be all set for hanging! Thanks for viewing this last minute craft idea! You can also letter them with a deco color paint pen if you are wanting to personalize them! Ahhh! I've been wanting to do Indie Wed for a couple of years now and it looks like 2017 will be the YEAR! Finally. I'm excited. Some of the vendors/artists that are lined up for the 2017 show! Indie Wed is THE alternative to traditional wedding expos. For those in the midst of wedding planing, Indie Wed offers a one stop shop for all the best wedding artisans and professionals around the country. Indie Wed is the longest running independent wedding show in the U.S. featuring unique, eco-conscious, handmade-focused, LGBT-friendly, and otherwise rad vendors. Cool, let me know all the deets! Check out www.IndieWed.com for complete details!!! Super excited that the Cubbies FINALLY did it! They won the whole doggone thing! Now its time to celebrate with some Christmas Ornaments. Grab a few from my Etsy shop! Supplies are limited and you can get a special price of $5 each through today. Extension of a Cyber Monday deal, don't wait, order now. Take care til' next time! It's been a looong time and so much has happened since the last blog. 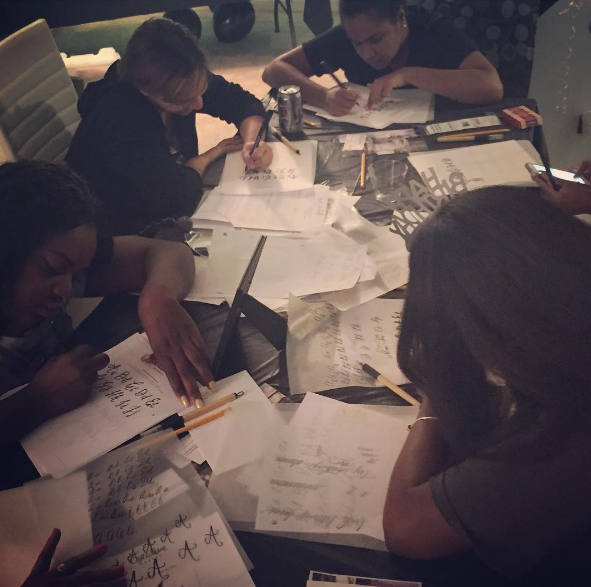 I need to recap the awesome calligraphy workshop I hosted on October 22nd... I've got some cool worksheets to share, and finally I want to get you up to speed on some cool holiday calligraphy ideas. Whew! FIRST, I want to share that I've FINALLY (and I do mean finally) put together a "how to" guide for creating mirrors. I get so many questions about this particular style of writing that I thought I'd go ahead and put together my BEST tips for doing these right the first time. You can purchase a digital download from my hand lettering page or from my Etsy shop! Grab the e-book by 11/30 if you can for the special rate! I'll be back soon with more goodies! Some inks work better than others based on the type of paper that you are using. Different kinds of ink: Waterproof, Non-Waterproof, India, etc. will have different absorption levels into your surface. Some blacks may even appear lighter/darker. One of the BEST ink comparison, explorations I've found done online (although limited to Higgins and Windsor Newton brands) was done by the Calligraphy Pen Blog... The owner does mostly illumination, and he is phenomenal, please check him out. He's one of those tireless calligraphy instructors that was doing this before it everyone knew calligraphy was cool! Taken from the Calligraphy Pen Blog. Notice how different in appearance your inks can appear. This image has not been retouched in any way. I like Sumi Ink personally. It is a permanent, black ink made from vegetable oil made specifically for painting and calligraphy. Others are decent too... Speedball, Higgins, J. Herbin, etc., I just like Sumi because it's one ink that really never lets me down, no matter what kind of surface I encounter. finally, the steel pointed pen, that's the BEST preparation I can recommend! You can find fine line brush pens at JetPens.com. This is one of my favorite places and if you are any kind of pen aficionado you will LOVE what they have to offer. They not only offer a HUGE variety of pens, they also have invaluable guides that help you shop for just the right tools. Can't say enough good things about Jet Pens. Anywho, similar to the pointed pen nibs, a brush pen SAMPLER kit is available and I highly recommend it. They actually have about 4 or 5 differnt sets available! Pencil first, then fine line brush pen and THEN the pointed pen tip! This will help retain these basic, necessary strokes in your muscle memory. Light, feathery pressure on your upstrokes, firm, heavy pressure on your downstrokes. Hope this was helpful, I'll be back with some more goodies later! I'm starting to prep for my second pointed pen class this season and I thought I'd share some tips for some of you interested in getting started in this medium! Part 1 includes info about the steel pen nibs you will need to start exploring and part 2 will cover inks and starting to make strokes! Anatomy of a nib... The tines separate in order to release ink, and the tines are released by the amount of PRESSURE you apply. Different nibs have different levels of stiffness so you will definitely need to experiment. The base is inserted into a nib holder. Nib selection can be very frustrating and definitely hit or miss. There is SO much information available now about nibs that its a bit easier... Back in 2007-08 when I first determined that I'd master this discipline, I just tried everything without knowing much about flexibility, nib manufacturers, etc. It was more along the lines of "ooh I like this one!" So NO shame if that's where you are right now because all of us write differently (with varying amounts of pressure) and nib preference is really, really a personal thing. I ordered a nib sampler from John Neal bookseller back then and they STILL sell this now. There is a GREAT assortment of nibs here. Many will say that the Nikko G nib is a good one for beginners. Typically, beginners are HEAVY handed and the Nikko G is pretty sturdy in this regard. Its all about pressure. You can provide beginners with pretty sophisticated nibs, but if it provides too much flexibility, there is a possibility that the first few strokes they make will utilize way too much ink, which will require them to dip the nib back into the inkwell more often, which will result in a level of frustration. When you apply pressure to the pointed pen steel nib, the tines part and release more ink onto your lettering surface. Moreover, I would recommend that you try as many nibs as you can and if you know you press down really hard when you write, I'd look for rigid, stiff nibs. Those will give you the most success to start. I'll be back soon with part 2! I've got SO much to share with you guys, but I've also got a ton of orders to push out. Just thought I'd share some of my latest IG posts until I can get you some cool calligraphy stuff to look at. I'm all about instruction and getting better at this craft this Fall, so stay tuned! 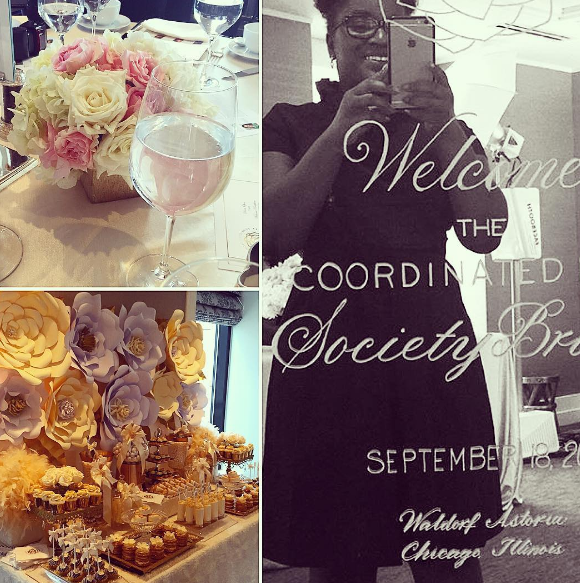 Clockwise from left: (1) Had the pleasure of providing mirror decor and attending a portion of The Coordinate Bride brunch at the Waldorf Astoria on 9/18 (2) Installed a mirror for Christina and Steven at the fabulous Oak Brook Hills Resort on 9/17 (3) Taught a craft night class the SAME evening in Richton Park! So fun! (4) Finally, there are STILL seats open for my 10/22 intro to calligraphy course! I'll be back soon! Follow me on IG for all the latest!